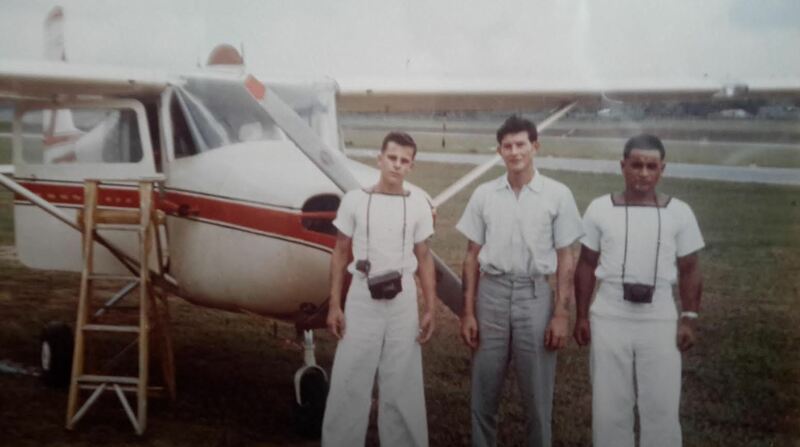 Here is an image of Owen Stuart in Singapore with my first two passengers after getting my private pilots licence through the Royal Singapore Aero Club. I was a signalman on Pukaki at the time, this photo would have been taken around Dec 1959 or Jan 60. Does anyone recognised these two chaps in uniform. They would have been junior seaman, or perhaps ordinary seamen at the time. The Captain of Pukaki was Cdr Williams, the Nav Officer was Paddy Bourke, and the Gunnery Officer was Humber Hulme, both of whom also came for sightseeing flights over Singapore, much to the annoyance of Cdr Williams who did not like fraternisation between the upper and lower deck. Hi Owen this not related to above but I attended the MVA 4th Malaysian Veterans Day in Wellington on 16th September and got talking to Jack Summerton (Army – who as it turns out lives just down the road from me in Waikanae) who mentioned that he knew you from way back. Its a small world of coincidence this week with your post coming up. Am I correct in recalling that a rating by the name of Wardle died whilst in Pussers, around this vintage? A car accident or something similar? Can’t remember his first name, but then again I frequently forget my own. Ralphs twin brother was an REM and was burnt in a fire at IRIRANGI about that time I believe. I was on Pukaki 59/60 but for the life of me can’t remember any of these! I was on Pukaki 59/60 but for the life of me i can’t remember any of these! Hello Lyndsay, Nothing wrong with your memory cells!!. The aircraft we did the South Island trip was indeed a Piper Tripacer, registration ZK-BSH, and what is even more suprising is that this aircraft is still flying in Marlborough area training people for outback landings on short patches of turf. Used the Chipmunk from the Aero Club quite a lot for sightseeing trips.